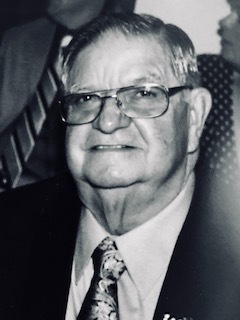 Obituary for Robert S. Dorko, Sr. | J. F. Rice Funeral Home, Inc.
Robert S. Dorko, Sr., 86 of Johnson City passed away on Wednesday, June 20, 2018. He was predeceased by his parents, Michael and Julia (Helen) Dorko; granddaughter, Cristin Hulbert (Bronson); great granddaughter, Rylie Hulbert and brother, Richard (Elizabeth) Dorko. Robert is survived by his loving family; his wife of 60 years, Concetta (Connie) Dorko; three children, Robert (Eileen) Dorko, Cynthia (Edwin) Bronson, Michael (Patricia) Dorko; six grandchildren, Stephanie (William) Fells, Jennifer (Jeremiah) Rawson, Matthew Bronson, Emily Dorko, Patrick Perrin and Hannah Dorko; four great grandchildren, William, Jackson, Juliana and Jacob and many nieces and cousins. Robert served in the United States Navy and was a member of the American Legion Post 80. He retired from IBM with over 25 years of service and was a member of their Quarter Century Club. Robert was a devoted member of St. James Church where he served as a Eucharistic Minister, lector and usher. He was also involved in the Saturday morning Men’s Prayer Group, Over 50, the funeral luncheon team and was an Associate of the Sisters of St. Joseph’s of Carondelet. The family will receive friends on Tuesday from 10AM until 11AM at St. James Church, 131 Main St., Johnson City. A Funeral Mass will follow at 11AM with burial in Vestal Hills Memorial Park. In lieu of flowers, donations in Robert’s memory can be made to St. Jude Children’s Research Hospital.